At IWCS Conference 2012 Windak Inc presented its latest information on products such as NEW Spool Winder SW6-14 andAutomatic Reeler AR24. from 165mm (6.5") to 360mm (14") in overall diameter. Spools are automatically loaded and unloaded into/from the spooling head. to reduce time between product and spool changeovers. Output of the new spooler is 3 spools per minute! and off line and loads and unloads the empty reels automatically and includes stretch wrapping of spool to contain the cut end. The output of the machine is 2 reels per minute! 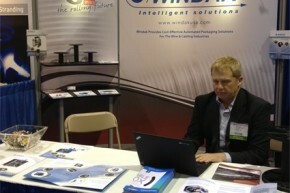 Windak Inc. received several solid sales leads that should close in the near future. Thank you for visiting our booth and we look forward to seeing you at the next show!